Members of ABCRA, GYRA and the Yorkville BIA accompanied Chief Blair on a tour of the Yorkville Area on October 8th, 2013. PHOTO ABOVE: Here we see ABC's own Linda Chu leading the tour group. L to R: Staff Sergeant Matt Moyer, Staff Inspector Heinz Kuck (Unit Commander of 53 Division), Chief William Blair, Gee Ghung (President of GYRA), Linda Chu (Director ABCRA). 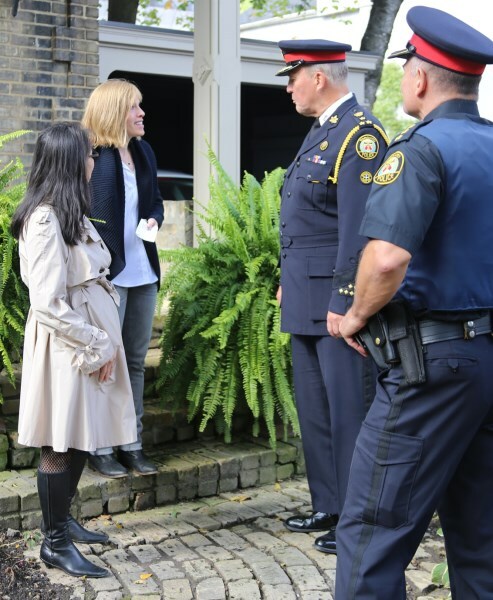 L to R: Linda Chu (Director ABCRA), long-time Yorkville resident Rebecca Barrett, Chief William Blair, Staff Inspector Heinz Kuck (Unit Commander of 53 Division).